‘Where are you going this time’ my friend Lucy asks when I tell her I will be away from school the following week. ‘Is it near Crystal Bay?’ she asks. I shake my head. Last year Lucy came with us when we visited Crystal Bay. It was a fun holiday, even though I was locked up in a storeroom by a mean lady called Nancy who thought I was spying on her. Ten-year-old Sage Cookson accompanies her television chef parents whenever they travel to shoot an episode of their famous cooking show. It could be lonely, and she does miss her best friend Lucy, but each trip is full of adventure and often intrigue. This time, the family are off to Townsville in Queensland in search of sun, sand, sea and seafood. Just off the coast, headed their way is a cyclone. Their time in Townsville is nothing like they thought it would be, but Sage and her family manage to bring their own sunshine. And she nails her school assignment! Text is large, images accompany every chapter heading and as a bonus, there’s a recipe at the end! Sage’s life is an unusual one. Mostly, it’s an adventure and she has caring parents who make sure she is safe AND completes her school work. She manages her social isolation by keeping in regular contact with her friend, Lucy. She can also rely on the long-time crew of her parents’ show. But she’s never experienced a cyclone from this close and this trip is more ‘exciting’ than she could have imagined. In the aftermath, she finds a way to help the helpers. Recommended for newly independent readers. who wanted to see the big world. All the other rhinoceroses do the things that rhinoceroses are supposed to do: they wallow in the mud, bathe in the sun, eat grass and rub their horns against trees. But for one small rhinoceros these things are not enough. She wishes she could see the world. And, although she knows that rhinoceroses can’t build boats, and especially can’t sail and steer boats, she builds her own little boat and sets off to see the world. Once Upon a Small Rhinoceros is a gentle, humorous but inspirational picture book story. The text tells a tale of courage and following dreams and will appeal to young dreamers. The mixed media illustrations are in gentle tones, allowing the rhinoceroses to star both in the jungle and in the settings the young rhinoceros travels through. A divine offering for children and adults alike. ‘You should go for him, Rosie,’ I say. ‘I haven’t been moping,’ I prtoest feebly. Rosie and Mum exchange glances, then simultaneously pull identical hangdog faces at me. I scowl back at them. Lucy is a girl in between – between jobs, between relationships, between cities. Now she’s moved in with her parents, and her ten year old dog, Glenda, and doing not much of anything, while she recovers from the break up her relationship. Her parents might be happy to have her, but they’re not happy with her sulking. Even her best friend Rosie – who makes everything fun – is getting sick of her mooching around. It’s time to get her life back in order – but that definitely doesn’t involve hooking up with the gorgeous son of her new neighbor, who has a girlfriend already. Girl In Between is a funny, warm story about young thirty somethings figuring out who and where they want to be in their life. Lucy and Rosie are both still single, and although they are not racing to settle down, both know they want something more than they have. Adventures and escapades in their home town of Rockhamtpon, as well as in Japan and England could help them find clarity – and, if they don’t, they’ll have fun trying. It was an odd engagement present. Heirloom or not, such gifts were not usually covered in grime and dust. Pip sneezed as she started unpacking four boxes of antique French pots: copper boilers, streaked and mottled with watermarks, so when the soft morning light reflected off the pots and hit the white walls of the tiny worker’s cottage, they rippled with rainbows. Some of the pots were so large Pip had to brace herself to lift them out of the boxes. When she pulled off the lids, their blackened insides were etched and lined with age. When she moves in to a tiny workers cottage with her fiance, Jack, Pip really doesn’t have room for the set of large copper pots her parents send as an engagement gift, but she is determined to have them on display. They bear memories of her childhood and a deeper connection Pip doesn’t completely understand. but the warmth of the copper pots might not be enough to keep Pip’s plans on track. She wants to get her PhD project finished before she and Jack get married and travel, but Jack is impatient, and wants everything to happen now. In 1427, Artemisia, the cook at the Chateau de Boschaud also has copper pots. she is busy preparing the dishes, the settings, even the special bathing waters for the Lord and his bride. It is tough work, but it is made easier by Artemisia’s secret. this will be her last day at the chateau: soon she will be free and ready to build a new life. The stories of Pip and Artemisia are separate, yet there are connections across the many centuries between their lives, and Artemisia’s vast knowledge of herbs cooking are not only reflected in Pip’s interests, but are even shared through treasured finds. Readers will want to trace the adventures of each, o find out whether happiness is possible for either, or for both. The Midsummer Garden is a satisfying blend of contemporary and historical fiction, with each story compelling and well wrought, and the links between the two intriguing. Themes of happiness, of family lore, relationships and self fulfillment are explored and food lovers will enjoy the culinary detail. As if! My parents are used to travelling. So am I, because I always go with them. They knew exactly what they need to do to get to the airport, check in and be on board in time. Çoming!’I call, quickly finishing the text message to my best friend. Off to the airport now. See you next week. I press send, put my phone in my pocket, and grab my backpack and suitcase. Sage and her parents are off to Singapore, now their work on the new cookbook is just about done. They have just one tiny segment to film, but the rest of their week is pure holiday. They are thrilled to see an article in the inflight magazine about the new book. Everything is going well. Things start going wrong as soon as they land. And it must have something to do with the pink-haired lady who seems to turn up everywhere they go. Ten-year-old Sage has a life many would envy: she travels around Australia and beyond with her television chef parents. Somehow, wherever they are, there are mysteries. Luckily Sage is observant and quick-thinking and is good at solving them. Sage stays in touch with her friend, Lucy, by text and that means that her friend sometimes becomes part of the mystery-solving. Sage’s parents try to make her life as normal as possible, including giving her a phone to keep in touch with her best friend. This is a fun, realistic adventure mystery series sure to make many newly independent readers wish they were Sage! ‘But I don’t know what to paaaaack,’ my friend Lucy wails down the phone. Sage Cookson is the daughter of famous TV chefs and has a wonderful life travelling around with her parents. But she misses her best friend, Lucy, so she’s excited that Lucy is joining them for this trip. They are off to a seaside town and there’s the promise of beach and great food. There’s also a mystery as an old foe reappears. It might be just coincidence, but Nancy is no more friendly than when last they met. ‘Fishy Surprise’ is episode three in this series for young independent readers. Sage’s life is much more exciting than that of many other ten-year-olds, but it also has its challenges. Not spending enough time with her friends is one of them. Not this time. With Lucy beside her, Sage has an accomplice as she works to solve this mystery. Young readers will thrill to the life Sage leads and empathise with her travails. Themes around family, friendship, loyalty round out these stories and add filling to the pastry. Recommended for independent readers. ‘Lucy! Your mum’s here,’ my mum calls up the stairs. We’d been having so much fun together that we didn’t notice how late it was. We’d been talking, and listening to music and surfing the net, and laughing and doing all the things we don’t get to do together when I’m away. Sage Cookson travels a lot. Her parents are television cooks and she goes where they go. She loves the adventure and the travel but sometimes misses her friend Lucy. In this second Sage Cookson adventure, Sage travels with her parents to Harmon Island, an island off the coast of Tasmania. There, they will film an episode about the bakery and their amazing pies. But Bettina, one of the bakery’s owners loses a ring and thinks Sage has something to do with it. Sage has to work quickly to solve the mystery before others also begin to believe she is responsible. ‘Ring of Truth’ is the second instalment in this new series from New Frontier for independent readers. Sage is a normal, sometimes messy, child who would rather be solving mysteries than doing her homework. She enjoys her travels with her family and their tv crew, but also misses time with her friends, especially Lucy. In each book, there is a mystery to be solved, and Sage is the girl for the job. She is observant, quick-thinking, caring. And there is food. Good food. Great fun: interesting settings and some sleuthing. Recommended for independent readers. He ate the same seeds. Slept in the same loft. Gary is just like the other racing pigeons – except that he can’t fly. So, on race days, when the other pigeons head off on adventures, Gary stays home and dreams. And, when they come home, he collects souvenirs and information which he records in his scrapbook. When Gary accidentally finds himself in the travel basket one raceday, he wonders if he’ll ever find his way home. But his scrapbook provides the clues he needs to plot a route home. Gary is a gently whimsical picture book about daring to take risks and follow dreams, no matter the obstacle. Readers will love the idea of a flightless bird using ingenuity – and public transport – to overcome his perceived handicap, and the way the other birds try Gary’s way, too. They will also adore the mixed media illustrations, with pastel hues and lots of detail to explore, especially in the maps and souvenirs which Gary collects for his scrapbook. A beautiful picture book, Gary is suitable for all ages. If a set of wings suddenly grew out of my back, I’d be over the moon! I haven’t told any of my friends about my dream of flying. They’d just laugh at me. Every kid knows there are good laughs and bad laughs. I’m sick of the bad laughs. Larni struggles at school. Words and letters don’t keep still on the page, and the other kids laugh at her – even her friends. So she can’t wait for the school holidays, when she is going on a plane to visit her Gran up north. Gran is delighted to see Larni, but sad when Larni says she isn’t good at anything. Gran assures her that she will find the thing she is good at. Sure enough, when Gran sits down to her sculpture proejct, Larni finds that she has a special talent for making things. Flying High is a short chapter book about self-confidence, and family ties, especially between grandparents and grandchildren. This is the latest of several books by Morgan and Kwaymullina, a mother-son team, and illustrated by Craig Smith. Each story is a stand alone tale, but all feature indigenous chidlren and their families doing things which all children will relate to – family outings, holdiays, spending time with extended family and so on. As such, these books are not only a wonderful opportunity to engage indigenous children, but also for children of all backgrounds, who are offered so many books with anglo-saxon characters, or where non-anglo characters confront issues of difference. The issues here – learning difficulties, self-belief and family closensess – are universal. With lots of illustrative support and accessible text Flying High is suitable for junior primary or for older readers who require extra support. This was not the great adventure I had anticipated. I wanted to swim back to my mother, to feel her arms around me, to smell the delicious spicy fish she would be cooking instead of this disgusting mixture of stale milk and filthy toilets. The wind roared in the rigging. The waves slapped the hull so hard that I knew I would be battered to death immediately if I jumped into the sea. My mother always complained that I would drive her crazy; I was so careless and afraid of nothing. But I am not stupid. Although my heart was aching and I desperately wanted to go home, I would never let the sea take me. Jose has lived all of his life on the island of Mauritius, but his father has arranged for him to travel and work on board the ship Uranie. Jose anticipates a life of seeing interesting places and having adventures. He doesn’t expect to meet a woman on the ship. It is 1818 and women are not allowed to join naval expeditions, but Rose de Freycinet has decided she cannot bear to be apart from her husband, and besides, she wants an adventure of her own. Jose is not impressed. Rose wants to teach him to read and write and her very presence makes ship life more dangerous. But as their journey continues, a friendship develops between the two, and Jose becomes as loyal as most of the other sailors. To See the World is the fictionalised account of the journey of French ship Uranie which attempted to circumnavigate the world and conduct scientific research. Rose de Freycinet, the wife of the expedition leader, Louis, became the first woman to write an account of such a circumnavigation, including their encounters with pirates, and cannibals, and their shipwrecking on the Falkland Islands. While this is a work of fiction, the character of Jose is based on a real boy, and the events of the story use real events, drawing on journals and other documents. Each chapter of the book opens with an image or painting from the time, from the National Library of Australia’s collection. 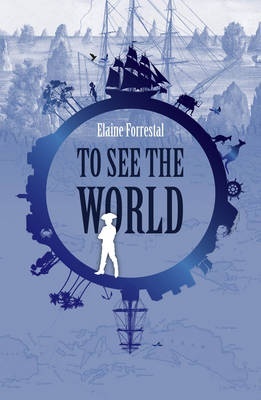 Suitable for middle and upper primary aged readers, To See the World is an intriguing tale of history, travel and an adventurous woman. Available from good bookstores and online .